Earthly Body Massage And Body Oil High Tide is made with natural oils including hemp seed and sweet almond oil. 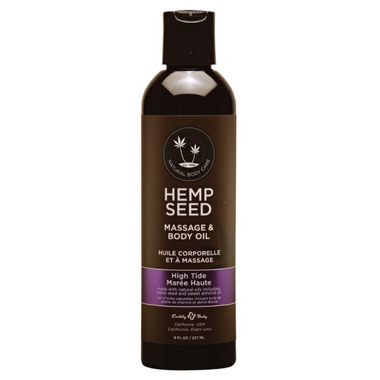 Made with a blend of natural oils (including Hemp Seed, Almond, grape seed, apricot oils and vitamin E), this long-lasting Massage & Body Oil absorbs quickly to deep condition and moisturize your skin. Emollient-rich oil blend works to lubricate skin and provide superior slip while leaving a non-greasy residue on skin after massage.